REG’s tourism specialist recently attended the London Adventure Travel Conference, an invitation-only networking event primarily for UK-based adventure travel tour operators and outdoor clothing/equipment suppliers. The goal of this activity was to promote tourism in the Western Balkan countries to tour operators and promoters in the target market of Europe. During the conference, the tourism specialist made presentations about the new regional tourism products REG developed in 2014. In addition, he had personal meetings with the Directors and CEOs of multiple influential companies in the travel industry, including: Wanderlust, Berghaus, Chameleon Worldwide, The Natural Travel Selection, KE Adventure Travel, and Exodus. Rafting the Una River. One of the many adventure tourism activities in the Balkans. The Middle East is considered a high-potential alternative market for processed fruit and vegetables (F&V) products from REG countries. However, the level of understanding of the current market situation is insufficient. In order to ameliorate that problem, and to approach new prospective markets, the REG Project organized a trade mission to Dubai, UAE. During that mission, the REG Project facilitated a visit to GulFood Trade Fair from February 8th through 12th. At the trade fair, participating F&V companies were able to analyze the competition, understand current trends in Middle Eastern export/import markets, and meet potential buyers. Gulfood is the world’s largest international food and hospitality trade show, and attracts thousands of leading food exporters and importers, trade agents, and buyers. All participating companies were represented by their owners, CEOs, and export directors. Based on the profiles of participating companies, the local trade agent REG contracted was able to develop a detailed agenda for B2B meetings and visits. Exhibitor stand at Gulfood Trade Fair. Dubai, UAE. Throughout the course of the fair, REG companies had several prearranged meetings with importers and distributors including many direct one-on-one meetings with sales managers for regional importers. Participants were able to present their production programs, export profile, certifications and corporate strategy, and to discuss opportunities for export partnership. Based on their experience at Gulfood, participating REG companies expressed interest and commitment to exhibit at Gulfood trade fair next year, a possibility which REG consultants are currently following up on. ITB Trade Fair floor. Berlin, Germany. The REG project supported the participation of 24 representatives from REG countries to attend and present at Fruit Logistica in Berlin, Germany from February 4th through 6th. Fruit Logistica is one of the largest F&V trade fairs in the world. This year, 2,785 exhibitors from 83 countries exhibited at the fair and presented their product portfolios to some 65,000 trade visitors from more than 135 countries. 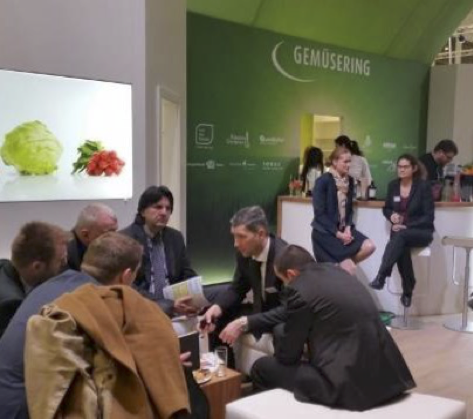 Participation at Fruit Logistica was an opportunity for F&V producing and packaging companies from the Western Balkans to enhance their understanding of post-harvest handling of fresh produce, including storing, grading, packing and shipping in order to comply with market demand. The activity also assisted the participating companies in establishing relevant contacts, presenting their companies to potential buyers, managing existing customer relationships, and developing new business. The event agenda included prearranged B2B meetings with selected relevant importers, traders, and large retailers. At these meetings, companies had the chance to individually present their company profile, export experience, and capacity to offer certain high end products to the German market. This opportunity to network with key players in the F&V industry should lead to new export partnerships and strengthen linkages with existing customers. The REG project will be monitoring new deals and other positive outcomes that develop as a result of this activity. In order to promote REG project work in tourism development, and to recruit partners for REG project activities, the Western Balkans Geotourism Network shared a stand with Via Dinarica in the Adventure and Sustainable Tourism Hall at the Internationale Tourismus-Börse Berlin (ITB) held March 9th to 13th. ITB is the world's largest tourism trade fair, which this year drew more than 10,000 exhibitors, 600 qualified buyers, and 110,000 visitors. Many regional companies and organisations attended, including the national tourism promotion agencies from Albania, BiH, Kosovo, Macedonia, and Serbia. Jack Delf presenting at ITB Trade Fair. Berlin, Germany. REG tourism consultant Jack Delf made a public presentation at the fair, promoting the region as the best new tourist destination in Europe, and introducing the seventeen new tourism products REG developed during 2014. He also arranged meetings with 26 buyers and marketers of tourism products to discuss future collaboration. This activity was intended to promote the Western Balkans as one singular tourism destination. Participation in ITB raised awareness of the tourism products available in the Western Balkans region and assisted REG project partners in establishing relevant contacts, presenting their companies and products to the media and potential buyers, and developing new business leads. In preparation for the AdventureNEXT regional adventure travel summit to be held in Macedonia in May of 2016, a series of AdventureEDU trainings will be held across the Western Balkans region. AdventureEDU is a six-module training program by Adventure Travel Trade Association (ATTA) which addresses the following key areas for successful operation of an adventure travel business: adventure tourism trends; product development; marketing tactics; operational excellence; business management for suppliers; and safety and risk management for adventure travel companies. The first event in the series was held in Macedonia from March 27th -28th. The focus was on two out of the six topics: operational management, and safety and risk management. The overall event, which was organized by the USAID Small Business Expansion Project (SBEP), was attended by 42 stakeholders from Macedonia, Albania, Serbia, and Bosnia and Herzegovina. Eight of these stakeholders were supported by REG. Attending the training built the capacity of the local and regional service providers to adequately respond to standards and expectations in the international tourism market. NKBV Bergsportdag is the largest mountain sport event in the Netherlands, welcoming around 5,000 visitors per year. The theme of the event was Your Adventure!, and it was attended by a REG representative and four regional tourism operators. The goal of this participation was to provide information and offer sales of the recently developed regional tourism products developed by REG; establish communication with the NKBV for possible joint promotional efforts in the future; and seek to identify specialized media active in the Dutch market. The NKBV generously provided 18 square meters of stand space to participants from the Western Balkans. Four groups shared the stand: Zbulo from Albania, Herzegovina Lodges from Bosnia and Herzegovina, Western Balkans Geotourism Network, and the Via Dinarica Alliance. Connections were made with multiple tour operators in The Netherlands who are interested in expanding their selection of tours to the Western Balkans, and REG staff will be closely monitoring discussions and eventual deals that may arise as a result of the activity. Additionally, REG tourism consultants are in discussions with NKBV to have more regional operators participate again next year. This newsletter is produced by USAID’s Regional Economic Growth REG; Implemented by SEGURA Consulting LLC.